Kindred Single sink 20 Ga - 13-1/8" X 15-1/8" X 6"
Single bowl 20 gauge, topmount hospitality sink, with rim. Sink features hard working satin finish bowls, a sparkling mirror finish rim, and center drain. Ideal as a secondary sink in an island or as a dedicated hospitality sink. Backed with the standard Kindred Limited Lifetime Warranty, your assurance of quality,. Single bowl hand fabricated 20 gauge dualmount sink. Faucet ledge has 1 hole drilling. Sink may be installed above or below counter. Bowl sloped to center of the waste hole, and drain lines for efficient draining. Commercial satin finish is a lovely complement to commercial look appliances, and is easy to maintain. Hand fabricated single bowl stainless steel undermount sink. Zero radius corners and commercial satin finish afford ease of cleaning. Rear placed drain means more storage below the sink. Sink bowl is pitched to center of the waste hole to ensure efficient draining. Undermount template and waste fittings are included right in the sink packaging! Large single bowl 20 gauge, top mount laundry/utility sink. Sink features hard working satin finish bowl, a sparkling mirror finish deck with 3 hole faucet drilling, and center drain. Large capacity 12 inch deep bowl. Ideal for big clean up jobs and laundry pre-soaking. Backed with the standard Kindred Limited Lifetime warranty. Kindred Single sink 20 Ga - 18-1/8" X 20-1/8 X 8"
Single bowl 20 gauge top mount rimback sink. Sink features hard wearing satin finished bowl, sparkling mirror finished rim, and included waste fitting. Quality assured with the standard Kindred Limited Lifetime warranty. A slim rim, and maximized bowl affords great use of space without sacrificing volume. 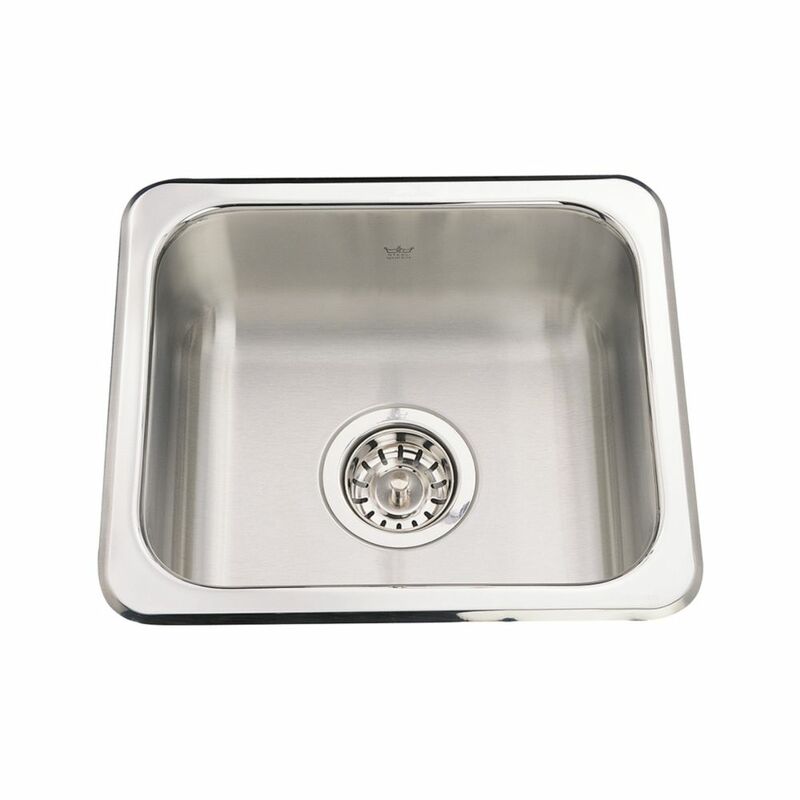 Single sink 20 Ga - 13-1/8" X 15-1/8" X 6" Single bowl 20 gauge, topmount hospitality sink, with rim. Sink features hard working satin finish bowls, a sparkling mirror finish rim, and center drain. Ideal as a secondary sink in an island or as a dedicated hospitality sink. Backed with the standard Kindred Limited Lifetime Warranty, your assurance of quality,.